Review of The Midwife (Sage Femme): Two Catherines are better than one! 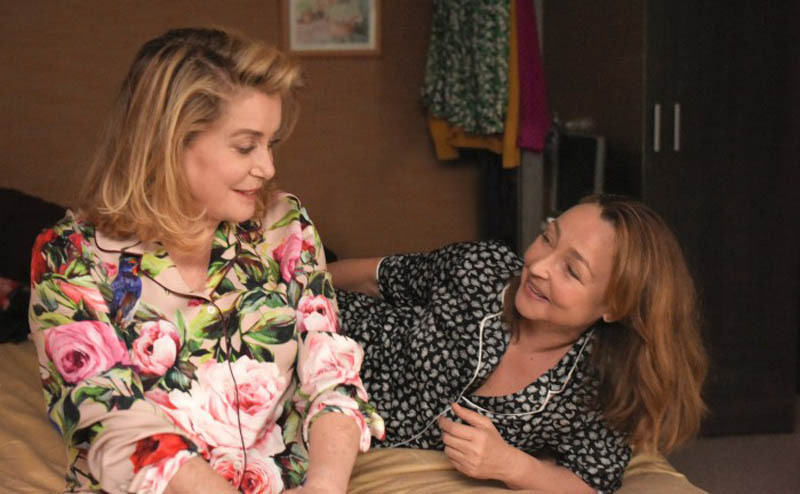 Catherine Deneuve and Catherine Frot are the main stars of French film The Midwife (Sage Femme). In The Midwife (Sage Femme) we get two Catherines for the price of one – Catherine Frot as Claire, the midwife of the title, and Catherine Deneuve as Béatrice, a figure from Claire’s past. For many viewers, seeing these two together will be more than reason enough watch the film. Claire works in a small hospital where all the midwives get along; her works exhausts her but she enjoys it. Her future is uncertain, because the hospital will soon be closed (hence the “Resist” sign hanging from it). She is the single mother of Simon, who is off at medical school. Actress Catherine Frot received maternity training and delivered six babies in the course of filming The Midwife (Sage Femme). We hear Béatrice before we see her, as Claire listens to her voice on her answering machine. We find out later that it’s a voice she has not heard for more than 30 years. With great reluctance, Claire goes into Paris to meet Béatrice, who is dying of brain cancer and looking to reconnect with people from her past. She needs familiar faces and moral support. Fair enough. Far as we can tell, making amends, and seeking forgiveness are not part of her plan. She seems to be the guilt-free type. Béatrice was mistress to Claire’s father, but she left him one day without a word of explanation. It’s not clear what she was to Claire – something between a big sister, aunt or mother figure? (Some of the critics who don’t like this film are annoyed that such things are not spelled out.) What is clear that Claire has never forgiven Béatrice – not for the affair itself, but for her departure. We have no idea how Béatrice has been supporting herself all these years either, though a scene in a gambling den offers a partial answer. I read somewhere that those were real gamblers, not actors. The two women have many disagreements and misunderstandings before they come to a sort of truce. (Minor spoiler, sorry, but you could figure that out from the trailer.) Though these women are straight, that’s the same pattern many romantic comedies follow, isn’t it? Béatrice does not have a visible love interest, but even though she is seriously ill, she still has an appetite for alcohol (whisky and wine) and lots of red meat. Cigarettes, too! However unlikely that might be in real life, it’s a signal that she’s not yet ready to just lay down and die and that she’s still chasing pleasure, wisely or not. 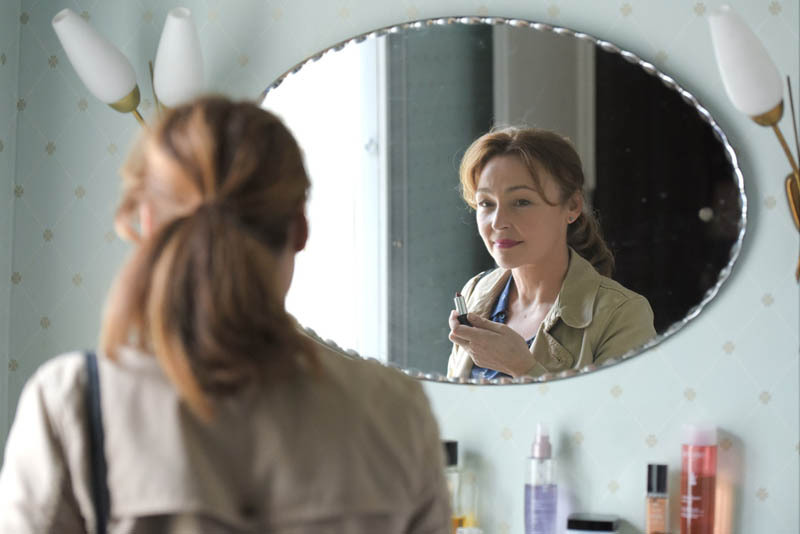 In the French film The Midwife (Sage Femme) Claire (Catherine Frot) checks her image after trying on lipstick belonging to Béatrice. She takes a spritz of perfume, too. See the bottle of Chanel No. 5, almost hidden by her shoulder? 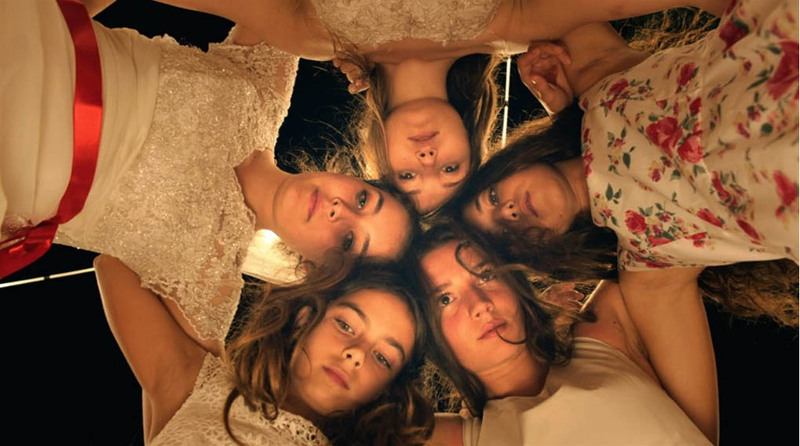 Writer-director Martin Provost (Séraphine, Violette) said he wrote the film with Frot and Gourmet in mind, and he was very happy that they agreed to appear in the film. In this interview, on a British site called The Upcoming, Provost talks about that and the birth scenes. Written and directed by Martin Provost. In Montreal, The Midwife (Sage Femme) is playing in the original French-language version at Cinema Beaubien and Cineplex Odeon Quartier Latin, and with English subtitles at Cineplex Odeon Forum. 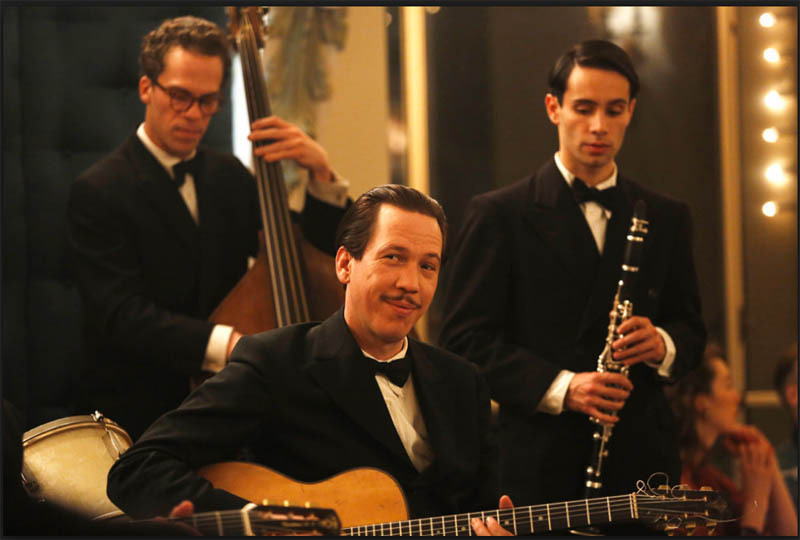 Reda Kateb, centre, plays jazz guitarist Django Reinhardt in the film Django, directed by Etienne Comar. Django’s manager reminds Django and his bandmates that saying “No” to the Germans is a very dangerous thing to do. The fictional femme fatale, Louise de Klerk (Cécile de France) points out that travelling into the heart of Nazi darkness would also be dangerous. There’s no happy solution to this problem. After a certain amount of dithering in Paris, Django and his entourage head for the border in hopes of crossing into neutral Switzerland. It’s a closely watched border, though, so they must wait (and wait and wait) while hoping that members of the Resistance will deign to help them eventually. The film pretty much grinds to a halt at this point. Django plays in local bars to earn some food money, sometimes hiding his face under a hat, sometimes not. It seems extremely foolhardy considering his fame and unique style. (SPOILER!) In one laughably silly scene Django is being chased by tracking dogs, so he lies down in the snow and sprinkles a few handfuls of the white stuff on top of himself. Somehow, I don’t think that would fool the dogs at all. As many viewers will already know, Django did indeed survive the war, but as far as I can tell, the film fudges his escape attempt. The implication is that he made it into Switzerland and presumably stayed there until the war was over, but in fact, the Swiss border guards would not let him in. What I did not know before seeing this film: Django Reinhardt could also play huge honking church organs and compose for them, too. Things I learned later from Google: Django Reinhardt was touring England with his Quintette du Hot-Club de France when England declared war on Germany on Sept. 3, 1939. Django returned to France immediately, but the Quintette’s violinist, Stéphane Grappelli, stayed in England until the war was over. In France during the war you could trade a Django Reinhardt record for two kg of butter on the black market. Django Reinhardt died May 16, 1953 at the relatively young age of 43. Screenplay: Étienne Comar and Alexis Salatko, based on the novel Folles de Django by Alexis Salatko. Music by the Rosenberg Trio. In Montreal, Django is playing, with English subtitles, at the Quartier Latin Cinema, 350 rue Emery, H2X 1J1. Django Reinhardt’s music, as performed by Nomad O Swing, Eclectic Django and Denis Chang, can often by heard at Montreal Jazz Bar Diese Onze, 4115-A, rue St. Denis, H2W 2M7. 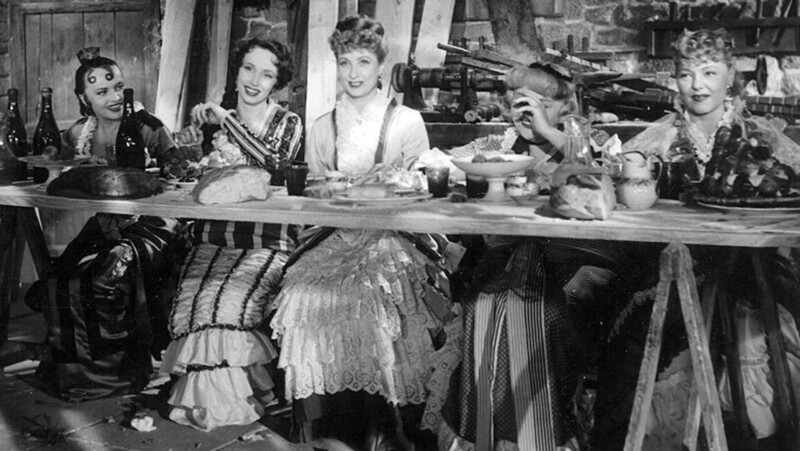 A scene from the film Le Plaisir (Pleasure) by Max Ophuls. The raison d’être of Le Cinéclub: The Film Society is to give people the chance to watch worthy films in their original film format, that is, not via DVD. This is not something average film fans can do at home, no matter how wonderful their setup might be. Tonight’s presentation is Le Plaisir (Pleasure) by Max Ophuls. It’s a 1952 film in three parts, (Le Masque, La Maison Tellier, Le Modèle) all based on short stories by Guy de Maupassant about men, women and their pursuit of pleasure. Jean Servais provides narration as the voice of de Maupassant. It’s in French with English subtitles. 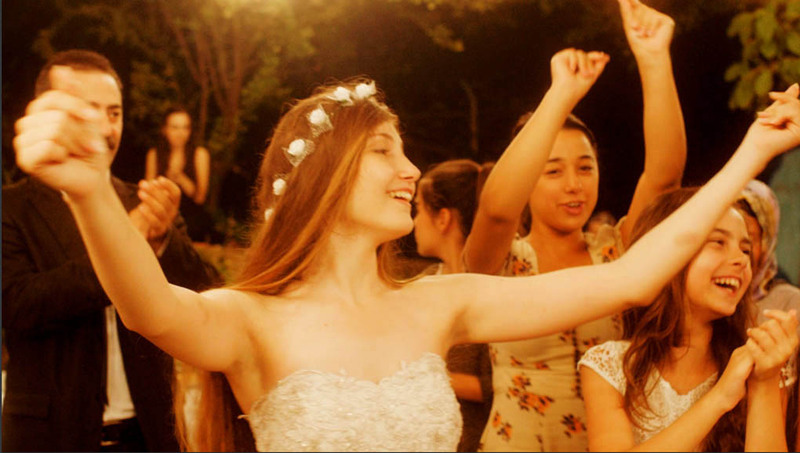 More details about the plots can be found on the Facebook page for the screening of Le Plaisir. The Criterion Collection has made a DVD of the film; people who cannot attend the screening might check that out. Those who do go, and like the film, could buy it for repeat viewing. Many reviews of Le Plaisir refer to that Criterion DVD, like this one, by V.F. Perkins in Film Quarterly and this one, by Fernando Croce in Slant Magazine. This essay by Robin Wood, appears on the Criterion Collection web site. Reading them in advance will prompt viewers to be on the alert for various events and film techniques, but those who dislike “spoilers” are advised to read them after watching the film. With Claude Dauphin, Gaby Morlay, Madelaine Renaud, Ginette Leclerc, Danielle Darrieux, Pierre Brasseur, Jean Servais and Jean Gabin. Sunday, Sept. 27, 2015 AT 6:30 p.m.